The jet stream is a river of wind that blows horizontally through the upper layers of the troposphere, generally from west to east, at an altitude of 20,000 - 50,000 feet (6,100 - 9,144 meters), or about 7 miles (11 kilometers) up. A jet stream develops where air masses of differing temperatures meet. For this reason, surface temperatures determine where the jet stream will form. The greater the difference in temperature, the faster the wind velocity inside the jet stream. 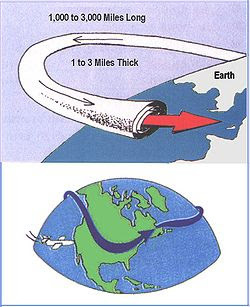 Jet streams can flow up to 200 mph (322 km/h), are 1000's of miles long, 100's of miles wide, and a few miles thick. o Air warmed in the tropics around the equator fuels the jet stream as it rises. Hitting the tropopause at about 58,000 feet (the layer of the atmosphere separating the troposphere from the stratosphere), it is drawn toward the colder air at the north and south poles. Positions of jet streams in the atmosphere. Arrows indicate directions of mean motions in a meridional plane. o At higher latitudes, the warm air cools and sinks, drawing more warm air in behind it. The cooled air flows back towards the equator, creating a loop or convection cell. As the earth rotates on its axis, so does the air around it. Due to this easterly rotation, rising warm air builds up momentum going the same direction. Thus, the jet stream cannot flow due north or due south, but makes an angular approach from the west, toward both poles. o Objects and air at the equator rotate around the earth's axis much faster than they do at more northerly or southerly latitudes. Thus, as the warmer air is drawn toward the poles, it moves faster, relative to the earth's surface. Because the rising warm air feeding the jet stream happens all along the equator, the effects accumulate, giving rise to high-speed winds. o The jet stream is no more than three miles thick, a few hundred miles wide and circles the earth. The size changes as temperature and other air masses meet the jet stream, causing it to shift its course. o Jet streams move around the Earth in a narrow band. They are created by the difference in temperatures between two air masses, usually cold polar air and warm tropical air. The temperature variance creates gradients in air pressure, which in turn affects the strength of the winds in the jet stream. The greater the variance, the greater the wind speed. Jet stream winds normally are 100 to 200 mph but can reach speeds as high as 300 mph. o A jet stream develops where air masses of differing temperatures meet, so surface temperatures help determine where they will form. The jet stream is snakelike, undulating like a river, because of the pressures on either side from the warm and cold air masses. When the jet stream is pushed south by a cold air mass, it allows high pressure to sink and create colder-than-normal weather in the South. In the opposite situation, when northern regions get warmer than normal, the jet stream has been pushed north by tropical air. Jet streams travel from west to east in both hemispheres. o Jet streams were discovered in the 1920s by meteorologist Wasburo Ooishi, who was using weather balloons for his study of high elevation wind patterns over Japan. In 1939, German meteorologist H. Seilkopf was the first to use the term "jet stream" in a published scientific paper. However, it wasn't until World War II, when the Japanese used the jet stream for fire balloon attacks on the American mainland, that the upper-level winds gained public recognition. Wiley Post, an American aviation pioneer, is credited with being the first person to fly within a jet stream. He and other WWII military pilots flying Boeing B-29 Superfortress bombers found the jet stream made high altitude flights difficult. o Currents travel at varying wind speeds within a jet stream, with the greatest speeds at the core. A jet stream contains jet streaks, where the wind velocity is higher than the rest of the stream. The jet streaks cause air to rise, lowering the air pressure at the Earth's surface. When surface pressures are low, the rising air can form clouds, precipitation and storms. o Jet streams play a major role in air travel. Eastbound flights usually take less flying time than westbound flights because of help from the fast-moving air. Jet streams can contain wind shear, a violent and sudden change in wind direction and speed, which is a major threat in air travel. Wind shear has caused airliners to suddenly lose altitude, putting them in danger of crashing. In 1988, the FAA decided that all commercial aircraft must have wind-shear warning systems, but it wasn't until 1996 that all airlines had them on-board. Types of Jet Streams !!! SUBTROPICAL JET STREAMS.— These jets, like the polar-front jets, are best developed in winter and early spring. During summer, in the Northern Hemisphere, the subtropical jet weakens considerably, and it is only identifiable in sporadic velocity streaks around the globe. During winter, subtropical jets intensify and can be found between 20° and 50° latitude. Their maximum speed approaches 300 knots, although these higher wind speeds are associated with their merger with polar-front jets. The core is most frequently found between 35,000 and 40,000 feet. A subsidence motion accompanies subtropical jets and gives rise to predominantly fair weather in areas they pass over. These jets are also remarkably persistent from time to time, but they do fluctuate daily. Sometimes they drift northward and merge with a polar-front jet. Over Asia in summer, the subtropical jet is replaced by the tropical easterly jet stream. TROPICAL EASTERLY JET STREAM.— This jet occurs near the tropopause over Southeast Asia, India, and Africa during summer. The strongest winds are over southern India, but they are not as intense as the winds encountered in polar-front or subtropical jet streams. This jet is closely connected to the Indian and African sum-mer monsoons. The existence of this jet implies that there is a deep layer of warm air to the north of the jet and colder air to the south over the In-dian Ocean. This warm air is of course associ-ated with the maximum heating taking place over India in summer, while the colder air is over the ocean. The difference in heating and cooling and the ensuing pressure gradient is what drives this jet. POLAR-NIGHT JET STREAM.— This jet meanders through the upper stratosphere over the poles. It occurs only during the long winter night. Remember, night is 6 months long over the pole in which winter is occurring. 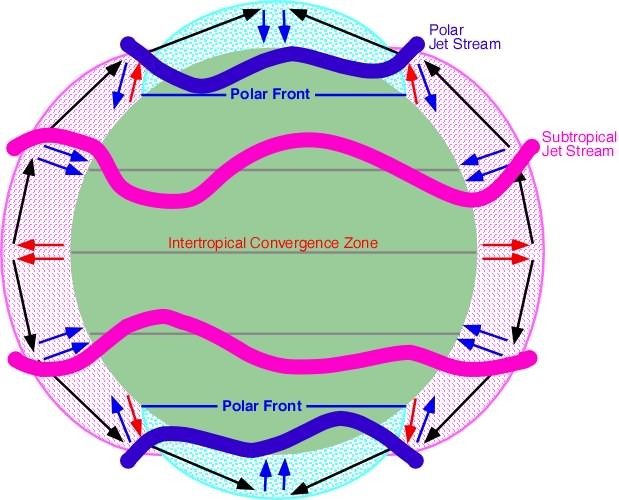 The polar stratosphere undergoes appreciable cooling due to the lack of solar radiation. The horizontal temperature gradient is strongly established bet-ween the equator and the pole, and the pressure gradient creates this westerly jet. The temperature gradient breaks down intermittently during middle and late winter in the Northern Hemisphere; therefore, the jet is intermittent at these times. In the Southern Hemisphere the temperature gradient and jet disappear rather abruptly near the time of the spring equinox. Detailed explanation on how the Jet Streams affect the Monsoons and the Indian Sub Continent ? There are different jet streams and in respect of the climate and monsoons of India it is the Subtropical Jet Stream (STJ) and the countering easterly jet that are most important. As the summertime approaches there is increased solar heating of the Indian subcontinent, this has a tendency to form a cyclonic monsoon cell situated between the Indian Ocean and southern Asia. This cell is blocked by the STJ which tends to blow to the south of the Himalayas, as long as the STJ is in this position the development of summer monsoons is inhibited. During the summer months the STJ deflects northwards and crosses over the Himalayan Range. The altitude of the mountains initially disrupts the jet but once it has cleared the summits it is able to reform over central Asia. With the STJ out of the way the subcontinental monsoon cell develops very quickly indeed, often in a matter of a few days. Warmth and moisture are fed into the cell by a lower level tropical jet stream which brings with it air masses laden with moisture from the Indian Ocean. As these air masses are forced upward by north India’s mountainous terrain the air is cooled and compressed, it easily reaches it’s saturation vapour point and the excess moisture is dissipated out in the form of monsoon rains. The end of the monsoon season is brought about when the atmosphere over the Tibetan Plateau begins to cool, this enables the STJ to transition back across the Himalayas. This leads to the formation of a cyclonic winter monsoon cell typified by sinking air masses over India and relatively moisture free winds that blow seaward. This gives rise to relatively settled and dry weather over India during the winter months. This year has been something of an exception. Atmospheric changes over the southern Pacific Ocean led to warmer than usual waters flowing into the Indian Ocean. This provided additional moisture to feed the monsoon systems. Further to the north the polar jet stream stalled due to being countered by Rossby Waves, there was a large kink in the stream and this was centred over Russia. The stalled system prevented weather systems being drawn across Russia and the kink acted as a barrier trapping hot air to the south and cold air to the north. The consequence of this static mass of hot air was the heatwave that devastated Russia. With the jet stream stalled the STJ was unable to transit across the Himalayas as it would do ordinarily, the monsoon cell to the south, fed by warmer waters in the Indian Ocean, had nowhere to go and as a consequence it deposited vast amounts of rain over Pakistan, Himalchal Pradesh amd Jammu and Kashmir and this led to extensive flooding. The monsoon wind that is deflected to the north as it crosses the equator is further deflected to the east by the mountains of Africa. The progress of the southwest monsoon towards India is greatly aided by the onset of certain jet streams including the crucial Somali jet that transits Kenya, Somalia and Sahel and exits the African coast at 9 degrees north at low level and very fast. J. Findlater, a British meteorologist observed this low level jet stream was found to be most pronounced between 1.0 and 1.5 km above the ground. It was observed to flow from Mauritius and the northern part of the island of Madagascar before reaching the coast of Kenya at about 3º S. Subsequently it ran over the plains of Kenya, Ethiopia and Somalia before reaching the coast again around 9º N. The jet stream appears to be fed by a stream of air, which moves northwards from the Mozambique Channel. The major part of this low level jet penetrates into East Africa during May and, subsequently, traverses the northern parts of the Arabian Sea before reaching India in June. Observations suggest that the strongest cross equatorial flow from the southern to the northern hemisphere during the Asian Summer Monsoon is in the region of the low level jet. This has intrigued meteorologists, because it is not clear why the major flow of air from the southern to northern hemisphere should take place along a narrow preferred zone off the East African coast. The importance of the low level jet arises from the fact that its path around 9º N coincides with a zone of coastal upwelling. As the strong winds drive away the surface coastal waters towards the east, extremely cold water from the depths of the sea rise upwards to preserve the continuity of mass. This upwelling is brought about by strong low level winds. After the low level jet moves towards the Indian coastline around 9º N, it separates into two branches. One appears to move to the northern parts of the Indian Peninsula while the other recurves towards the southern half of the Indian coastline and Sri Lanka. It is still not clear why the jet separates into two branches. Findlater analysed the wind profile for the months of July and August and found a relationship between the cross-equatorial airflow, between 1.0 and 1.5 km, over Kenya and the rainfall over western India. He opined that an increase in the cross-equatorial flow was followed by an increase in rainfall over the west coast. Oceanographers have been interested in yet another phenomenon, which appears to have some relationship with the low level jet stream off the coast of eastern Africa. This ocean current named the Somali Current, flows northward from the equator to 9º N, where it separates from the coast. It is a fairly strong current with a velocity maximum of 2 m m/s, but speeds as large as 3 m m/s have also been observed. The Somali Current may be considered to be a western boundary current of the Indian Ocean. But, its peculiar feature is a reversal in direction with the onset of the summer monsoon. In winter, this current is from north to the south running southwards from the coast of Arabia to the east African coastline; but with the advent of the summer monsoon it reverses its direction and flows from the south to the north. This suggests a relationship with the reversal of monsoon winds, but usually the oceans respond very slowly to changes in atmospheric circulation and oceanographers have wondered why the Somali Current reverses its direction and reaches its maximum speed nearly a month earlier than the onset of southwesterly monsoon winds. Certain interesting changes take place in the upper atmosphere with the advent of the summer monsoon. Towards the end of May, a narrow stream of air, which moves from the west to the east over northern India, suddenly weakens and moves to a new location far to the north of the Himalayas. This is known as sub-tropical westerly jet stream. Its movement towards the north is one of the main features associated with the onset of the monsoon over India. As the westerly jet moves north, yet another jet stream sets in over the southern half of the Indian peninsula. This flows in the reverse direction from the east to west. It is called tropical easterly jet, and it exhibits periodic movements to the north and south of its mean location during the hundred-day monsoon season beginning with the first of June and ending around mid-September. good work ..looking forward to learn more from you..keep updating such information. Good stuff..keep updating such Good stuff...thanks for writing such a post...knowledge which can enhance learning of the students as well as working people.